As of Fall 2007, we are certified by the CCOF (California Certified Organic Farmers) as a mixed-use facility. 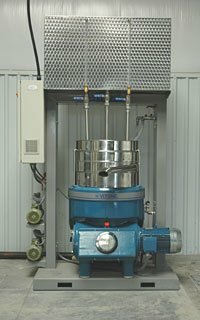 Our system offers both a stone mill and a blade crusher, which can run separately or simultaneously. Our traditional Frantoio with three granite wheels crushes 1.5 tons of fruit per hour, while the blade crusher processes 3 tons per hour. 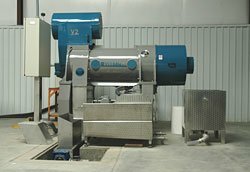 Specially designed to maintain a low operating temperature, the blade crusher operates in two phases and maximally conserves the organoleptic properties of any olive varietal, preventing undue bitterness. 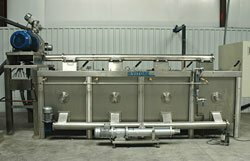 The malaxer, which converts the crushed fruit to a paste from which oil is eventually extracted, has four separate vats of 940 liters each. These can be grouped or used separately, affording flexibility in processing multiple batches simultaneously. This translates to faster service and greater convenience for our customers. The decanter separates oil from water and husk through centrifugal force. This component is lined with extra thick stainless steel and a tungsten carbide mesh to assure machine longevity and high reliability during critical weeks of heavy operation. The 3-phase capability further reduces waste by extracting nearly all water from the pomace. Every season, our partnering milling expert from Italy supervises our entire production and deepens our milling team’s instruction. Coming from the country with the most artisan mills in the world, this support is invaluable to Californians. After milling is complete, the oil is briefly settled in barrels before it is racked, blended, and bottled. We provide all required containers for a nominal fee. Copyright by Olivino © 2006-2019. All rights reserved.